I first met Betti-Sue Hertz in 2015 at the San Francisco Art Institute. 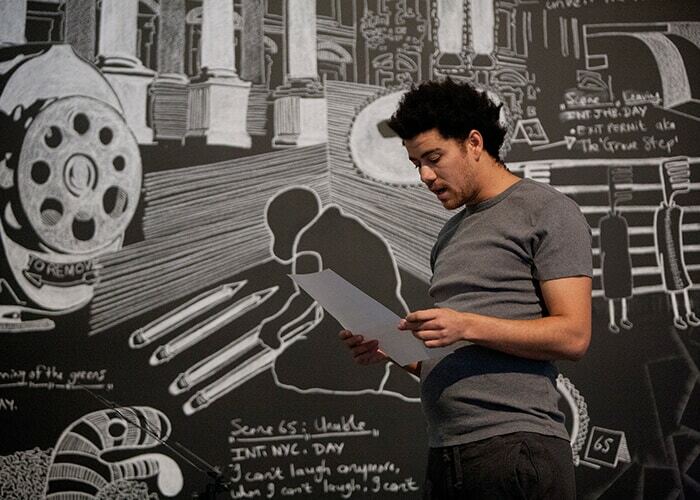 As we awaited a talk by cultural practitioner William Cordova – someone I had worked closely with as an educator at MoCA Miami – I learned of the long collaborative history between the two practitioners. It was heartwarming to hear them catch up, talk about the first exhibition they’d done together and the excitement around Cordova’s recent visit to the Headlands Center for the Arts residency programme in the Bay Area, where Hertz was Interim Director of Programmes. It was this moment that reaffirmed for me the beauty inherent in art, for bringing different people together to share conversations, ideas, and form lifelong friendships. 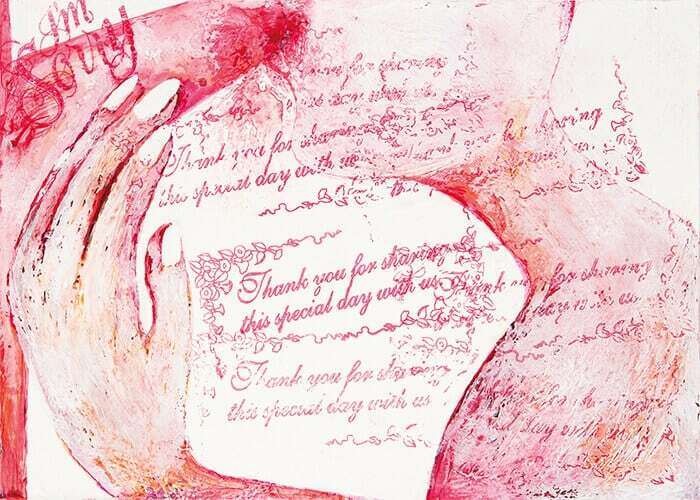 Some months later, after returning to Cape Town, I once again came across Hertz and her work. This time it was in her capacity as Director of Visual Arts at the Yerba Buena Center for the Arts (YBCA), a multi-disciplinary cultural hub in San Francisco. 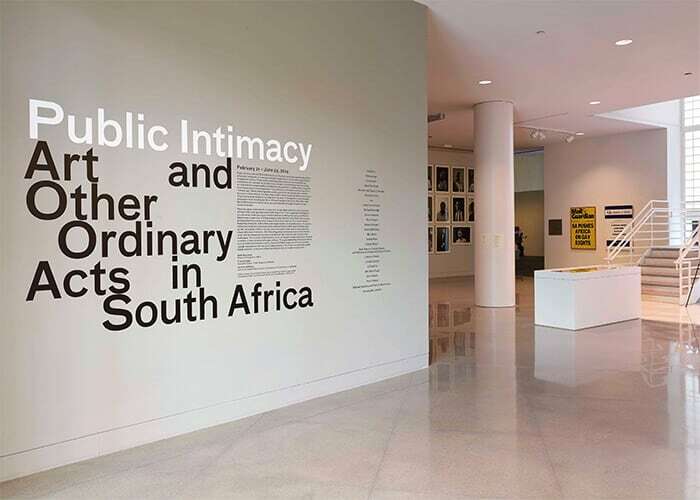 The project concerned was the 2014 ‘Public Intimacy: Art and Other Ordinary Acts in South Africa’ exhibition, a collaborative programme between YBCA and the San Francisco Museum of Modern Art (SFMOMA). 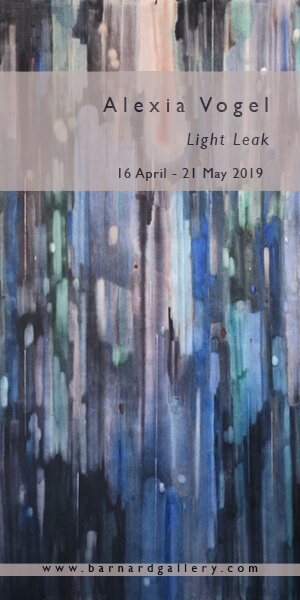 With twenty-five South African artists and over two hundred works, ‘Public Intimacy’ looked at the way “artists imagine present and future possibilities in South Africa,” and offered an honest look at how politics – in a country undergoing continuous change – are ingrained in everyday acts. I felt that with its particular scope, list of artists and manifold intentions, this project – which included both a symposium and a recently released publication – merited further research. With the opening of the new SFMOMA building across the road from YBCA this May, it was timeous to reach out to Hertz to find out more about the exhibition, its perceived impact and her insights about her own curatorial experiences. Houghton Kinsman: Shall we begin with how the collaboration between SFMOMA and YBCA came about and how it played out? Betti-Sue Hertz: The San Francisco Museum of Modern Art (SFMOMA) was closed for three years during the construction of their new building. They were generating programming with other Bay Area arts organisations and museums, as a way to stay active and keep works from their collection on public view. Dominic Willsdon, SFMOMA’s Curator of Education and Public Practice, approached me as Director of Visual Arts at YBCA (located across the street from the SFMOMA) and suggested that we work together to create a curatorial and institutional collaboration. We subsequently embarked on a series of conversations along with Frank Smigiel, SFMOMA’s Associate Curator of Performance and Film. Kemang Wa Lehulere, detail of stills from the performance of The Grass Is Always Greener on the Other Side at Yerba Buena Center for the Arts, 2014. Photograph: Tommy Lau. Image courtesy of the Yerba Buena Center for the Arts. What sparked the interest in putting together ‘Public Intimacy’? We were in search of an idea that would make sense for both SFMOMA and YBCA. At the time YBCA was committed to threading programmes – with a focus on the Global South – into our schedule across all the disciplines. SFMOMA’s mandate for their off-site ‘On the Go’ programming during the closure, of which ‘Public Intimacy’ would become a part, was to highlight the collection, build partnerships with regional arts institutions, continue serving their existing constituency and cultivate new audiences. With both of these agendas in mind we discussed ideas that could contribute to the complex scholarly and artistic discourses circulating about the Global South. SFMOMA’s Senior Curator of Photography, Sandra Phillips, suggested that we take a look at the South African photography collection, a group of very strong works produced since the 1960s by David Goldblatt, Ernest Cole, Santu Mofokeng, Zanele Muholi, Mikhael Subotzky, Jo Ractliffe and others. Viewing these works sparked an idea about the way intimacy had been controlled and monitored in South Africa both before and during apartheid. A question then emerged about how being intimate in public might be changing post-apartheid. 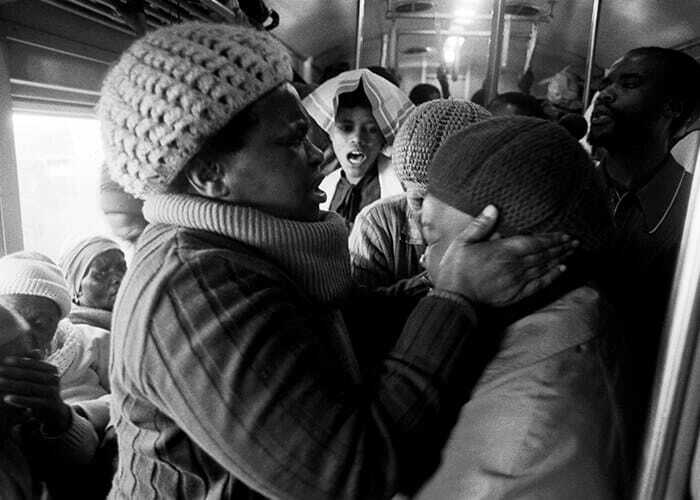 Santu Mofokeng,detail of Supplication, Johannesburg—Soweto Line, from the series ‘Train Church,’ 1986. From the departure point of ‘Public Intimacy,’ and with these two particular ideas in mind, how did the curatorial process unfold? We began by researching the South Africa art scene. We wanted to test our initial remote research against the realities on the ground, and experience the places where the art was being made. So we decided to travel to Johannesburg and Cape Town to meet with artists, art historians and critics, museum directors, curators, and gallerists. We also decided to go to Durban, as we wanted to reach out to artists living outside the two major centers for contemporary art. How valuable was that research trip to South Africa in understanding what was happening in the South African art world? None of us had been to South Africa, so the trip was indispensible for many reasons. We were very excited to meet with artists, visit museums and galleries, as well as universities, cultural centers and clubs. We wanted to get a glimpse into the artists’ world, their studios and social spaces, the rural landscape, the spatial and social structure of the cities, the pulse of the shopping malls and the rhythm of street life. I’m convinced that the project’s success was due, to a large extent, to the excitement and energy we experienced on the ground. Penny Siopis, work from the series ‘Shame’ (detail), 2002–5. To return to the theme of the exhibition, why this specific angle and why a particular focus on everyday life in South Africa? When we first looked at the photography in SFMOMA’s collection, David Goldblatt’s ‘Particulars’ series (from 1975) stood out. These up-close, tightly cropped photographs reveal intimate views of bodies – both black and white – in the public space of Joubert Park, Johannesburg. Through their record of gesture, style and skin, these intense images expose the complexity of the social codes of behavior and the rules of control that affected the everyday lives of individuals under apartheid. Additionally, we were inspired by Njabulo Ndebele’s 1984 essay The Rediscovery of the Ordinary, in which he writes, “the convention of the spectacular has run its course. Its tendency either to devalue or to ignore interiority… [is] its fundamental weakness.” With this essay, we found our curatorial grounding, bringing to the attention of U.S. audiences a quieter and more personal approach to upending decades of oppression through daily, positive social exchange. This approach also allowed us to further shape the project and to give structural curatorial support to the many artistic voices. We were determined to expand the project to include art forms that had been marginalised by museum culture. While sculpture and painting would still have a role, we wanted to reshape the map of contemporary production. Therefore, we shifted the focus to the triad of photography, performance and publication, each of which proved to have many forward-looking practitioners who are leading voices on the South African cultural scene. It is through this mechanism that ‘Public Intimacy’ was able to achieve its multi-disciplinary and multi-site ambition; which included a group exhibition in YBCA’s galleries, a gallery performance by Kemang Wa Lehulere, a theatrical performance by Athi Patra-Ruga; street performance by Sello Pesa and Vaughn Sadie, with Ntsoana Contemporary Dance Company; a research, archive and library project by Chimurenga that took place at the main branch of the San Francisco Public Library; and education and public programmes. In addition to this multi-disciplinary and multi-site ambition, I was intrigued by the exhibition’s complex mixture of young and experienced artists. I know you worked closely with William Cordova as a young artist, so do you feel you have a particular penchant for working with young, emerging artists? It’s funny you should ask that question. 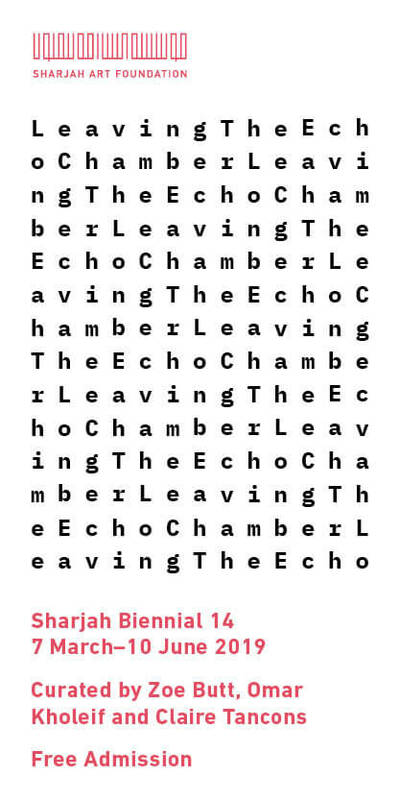 I want to work with artists who have clarity of vision, persistence and ambition as a person as well as in their work; when the artist is deeply connected to the larger horizons of the times, able to shift and change their own practice to meet political and societal changes and also access new theoretical positions or technologies (or both). Just recently, I was pleased to see works I had shown in group exhibitions in the early 2000s at the San Diego Museum of Art in two important solo exhibitions in New York, one of Chinese artist Cao Fei at PS1/MoMA and the other of Mexican artist Silvia Gruner at the Americas Society. That gave me cause to smile. Additionally, on a recent studio visit with the American artist Sarah Oppenheimer, she reminded me that I was the first curator ever to request a studio visit and show her work (in 2000 at the Sculpture Center). So, there are rewards for working with younger artists. And, it isn’t unusual to see their work develop and mature. However, it’s also important to exhibit the work of older artists who may be overlooked for their more mature innovations. For example, in 2008 I organised a solo show of the esteemed California-based artist Eleanor Antin, who is now in her 80s and continues to produce new work as her early work becomes part of the canon. There are many reasons to invest curatorial energy into the work of artists at all stages of their career. 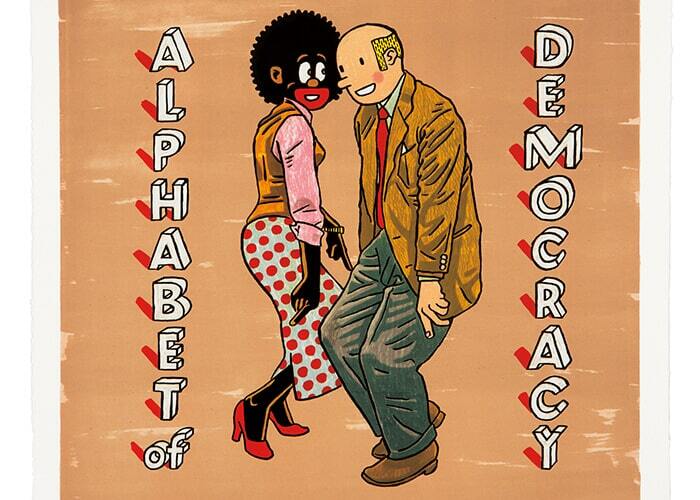 Anton Kannemeyer, detail of Alphabet of Democracy, from the series ‘Alphabet of Democracy,’ 2011. Indeed! On the idea of stages, it feels appropriate to ask what your impressions are of ‘Public Intimacy’ now, as you look back at it? Lastly, to return to your own curatorial practice, what are you working on now and what does the future hold for BettiSue Hertz? Currently, I’m co-organising a multiplatform project – exhibition, public programmes, university seminar, film series, performing arts commissions and archive – on the cultural critic, writer and public intellectual Susan Sontag (1934-2004), which is still in an early stage of development. I recently launched a lecture series at Stanford University based on my ‘Art and Social Criticism’ course and I am curating one of the inaugural exhibitions for the Manetti Schrem Museum of Art, on the campus of the University of California, Davis, which opens in November 2016. Cameron Platter, detail of Bring Back Lost Lover (installation view), 2014. 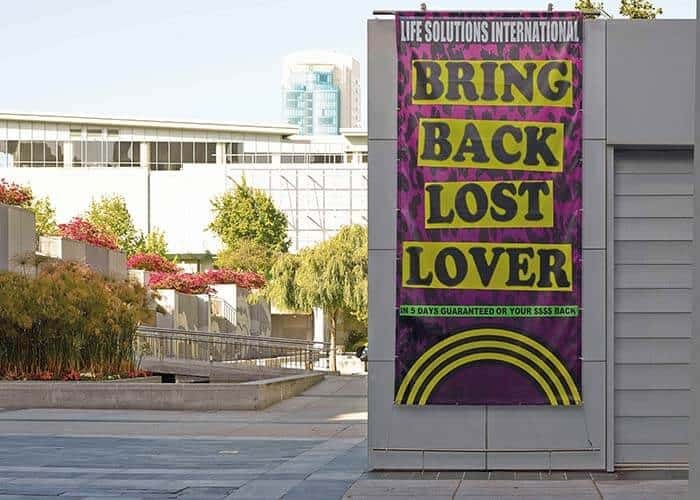 Image courtesy of the Yerba Buena Center for the Arts. Working between Cape Town and Sacramento, Houghton Kinsman contributes regularly to Highsnobiety, ART AFRICA, Contemporary And, Another Africa and Dazed and Confused magazines. He has worked as the Assistant to the Curator of Education at the Museum of Contemporary Art Miami. ‘Public Intimacy’ was jointly organised by YBCA and SFMOMA, and was on view at YBCA from 21 February – 29 June 2014.